At first I thought it was kind of dumb, and kind of intrusive, and kind of patronizing. The cafeterias at Mass General, where I work, started labeling every food and drink they sell with a red, yellow, or green dot signifying unhealthy, moderately healthy, and more healthy choices respectively. Say you're on line waiting to order a sandwich. A BLT sounds good, but bacon? Red! Mayo might be nice, but mustard is...green! More and more I found myself considering the "color" of my cravings. The system is simple--some would say, even, simple-minded. It doesn't take into account subtle, or not-so-subtle distinctions between foods. For example, a salty slice of turkey and an apple both get a "green" rating, something vegetarians, vegans, and most dietitians would dispute. The red-yellow-green program is really a pre-school-type scheme for alerting people to what they already know: fruits, vegetables, and lean proteins are healthier choices than chips, soda, candy--and bacon. But guess what? It works. Dr. Anne Thorndike, of Mass General's Division of General Medicine and Harvard Medical School reports in the American Journal of Preventive Medicine that in the last two years, the traffic light system has reduced sales of "red" items by 20 percent and decreased sales of the unhealthiest beverages by nearly 40 percent. In the same period, "green" items sold at a 12 percent higher rate than previously. Besides color labeling, another aspect of the program was placing healthier items more prominently at eye level. 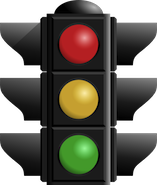 The "traffic light" approach works on the same principle as other feedback systems used routinely to modify behavior. Those "your speed is..." signs are more likely to make you slow down than a sign simply indicating the speed limit. A pedometer that counts your steps may inspire you to walk farther each day than the thought: "I ought to walk farther." One can easily see the success of the Mass General program and others like it translating into changes in food packaging and marketing. Can you imagine going to a grocery store with red, yellow, and green aisles? Reaching for a red box of crackers and deciding to go with the yellow box? Maybe your reaction to this is that it sounds creepy and nanny state-ish. But haven't we been manipulated, for decades now, by packaging and marketing, to eat the high fat, high sugar foods that have contributed to increased obesity rates? Maybe it's time to "change the light."